University of British Columbia English Major - Graduating in April 2019. Vancouver Film School - Writing for Film & Television Diploma (Honours) - 2011. Clarence Fulton Secondary Graduate (Honours) - 2010. 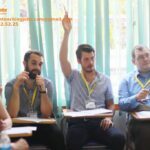 I am an ESL teacher that grew up in Canada, and I am hoping to teach in Hanoi starting in May or late April. In 2017, I completed the 100-hour+ TEFL/TESOL Certificate Program with the Canadian College of Linguistics. The theories and techniques I learned from Jeremy Harmer's How to Teach English, and how to assess my students' proficiency using the Canadian Language Benchmarks 2000 were invaluable to the 60-minute lessons I taught at the end of the course. In 2018, I worked for VGC International college as an ESL Language Teacher for both the Teen Summer/High School Preparation Program and as a substitute teacher for the adult program. During that time I was responsible for preparing and executing highly structured academic lessons plans. Currently, I am working as an English tutor at Reading Town for students in their elementary years. I have also been volunteering at Clarence Fulton Secondary, teaching lessons on rhetoric and psychology. Here, I have learned how to use different classroom layouts, interactive activities, and how to engage students in 150-minute lessons (Fulton uses the Copernican block system). I will have completed my English degree at the University of British Columbia by April 2019. I have a passion for education and travel. I hope to expand my knowledge and expertise while travelling abroad.